The first Mass Effect never made it to the PS3, and it seems like BioWare is doing everything in its power to make up for that with the release of Mass Effect 2. PS3 owners may be looking at a veritable banquet of extras when Mass Effect 2 hits the console next year. Aside from the game itself, the disk will apparently contain a number of pieces of DLC, as well as a brand new mission, said to last around six hours. These details come from an interview that Mass Effect 2 project director Casey Hudson gave to German PS3 magazine Play3, which found their way on to the BioWare forums via community representative Nathalie Edelmann. According to the interview, the German "Uncut" PS3 version will include the Kasumi - Stolen Memory, Overlord and Lair of the Shadow Broker DLC packs, as well as the aforementioned new mission. Also included is an interactive comic which is either called "Dark Horse," or by Dark Horse, and sounds like it allows PS3 owners to make some of the choices they missed in the first Mass Effect, as well as getting them up to speed with the backstory. It's not clear at the moment whether these extras are specific to the Uncut version in Germany, or whether this will be the standard on every PS3 version. We also don't know if this new six-hour mission is exclusive to the PS3, but we've reached out to BioWare for more information, and hopefully will be able to update you soon. In a separate interview, this time with Play3's website, BioWare co-founder Greg Zeschuk talked about some of the differences between the two versions from a technical point of view. He said that probably the most notable was the difference in the how each console handled graphics. He made it very clear that it wasn't a case of one console being better than another, but said that there would be some graphical differences between the two versions. Mass Effect 2 comes out for PS3 in January. UPDATE: BioWare has cleared up the confusion surrounding the PS3 version of Mass Effect 2 in a post on its forums. The disk will contain the game, the three DLC packs, an interactive comic by Dark Horse, and the Blood Dragon Armor that came with Dragon Age: Origins. 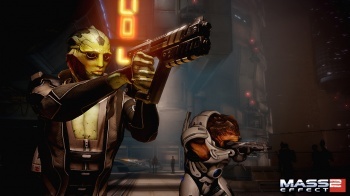 BioWare also shot down the idea of a new six-hour mission on the disk, saying that something had been lost in translation, and that the six-hour figure actually referred to how much more gameplay the DLC added.